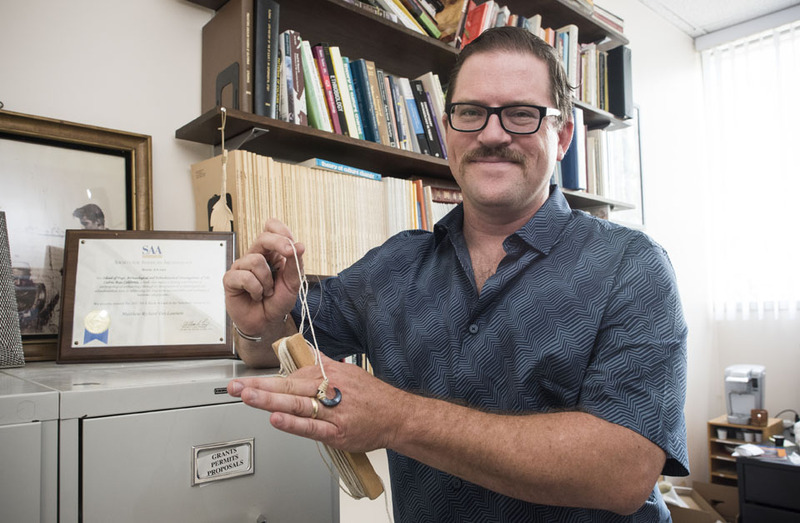 Professor Matthew Des Lauriers posing with replicated fishhook. Photo by Lee Choo. An international team of archaeologists, including California State University, Northridge anthropology professor Matthew Des Lauriers, received a grant from National Geographic for efforts in unearthing evidence that dates the arrival of Ancestral Native Americans to at least 13,000 years ago, off the coast of Baja California, Mexico. Des Lauriers’ team of archaeologists includes Oregon State University professor Loren Davis, who received the grant with Des Lauriers to continue investigations that started in 2000. What began as Des Lauriers’ dissertation research is now providing insight into an area locals call “El Piedron” (The Rock), formally known as Cedros Island, on the Pacific coast of Baja California, Mexico. Des Lauriers’ work reveals that the early Cedros Islanders harvested resources that were only available by traveling well offshore in watercraft. This provides support for the recent scientific theory that the ancestors of today’s Native Americans arrived from Northeast Asia, traveling along the Pacific coast, as opposed to a route along the east side of the Rocky Mountains. Both alternatives run through or along the massive 1,000-mile-wide land bridge that connected the Chukotka Peninsula in Russia to the peninsula of Alaska during the last Ice Age. Cedros Island is located in an isolated and largely unspoiled region in the state of Baja California, located on the Pacific coast of Mexico. After being occupied by indigenous populations for more than 13,000 years, the island was used for its natural resources by miners, missionaries and pirates for the past 500 years, according to Des Lauriers. As part of their graduate research, 13 of Des Lauriers’ CSUN anthropology students have worked on various aspects of the Cedros Island project, ranging from field excavations, laboratory analysis, 3-D scanning and replicative analysis of ancient artifacts, to geographic information scanning analysis of site locations and watersheds. 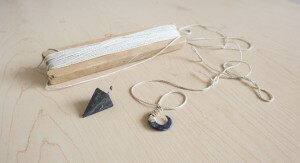 To test the hypothesis that Ancestral Native American arrivals were in fact using boats to reach a new home, Des Lauriers and his colleague Dustin McKenzie, archaeology professor at Cabrillo College, replicated the fish hook nearly identical to one found in 2009 during an excavation. Replicated fishhook that was used to test Professor Des Lauriers hypothesis on coastal migration. “It worked beautifully, catching two large sea bass within 15 minutes of fishing,” Des Lauriers said of the replica fishhook. Des Lauriers said that archaeologists have identified some of the potential routes of arrival of the first Americans by finding connections between archaeological findings across the world. He said part of his attraction to “the big picture” may come from constant travel as a child of a U.S. Marine. Growing up, Des Lauriers found the different places and travels fascinating. “Not everything is immediately apparent the first time you see something,” said Des Lauriers. “But you start to wonder, and that can grow into big questions. Des Lauriers plans to return to Baja California, to continue excavations in December.